To claim 17% discount enter code cds during checkout. Offer valid only on books shown in this page. Not in conjunction with other offers. 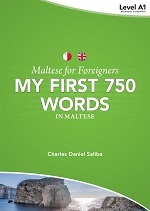 My First 750 Words in Maltese is a bilingual vocabulary book in Maltese and English that teaches Maltese vocabulary in an easy-to-follow format. It covers the basic vocabulary encountered in daily life. 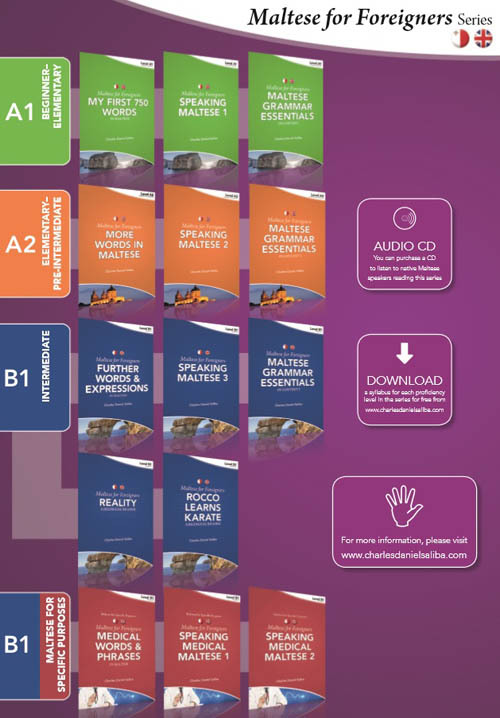 Each lesson contains pronunciation aids as well as the English equivalent for each word. The exercises and activities teach the vocabulary in a cyclical manner while sharpening your speaking, reading, writing, and listening skills. Explore the Maltese culture and geography. 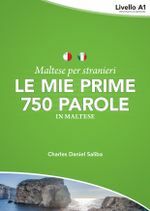 Le mie prime 750 parole in maltese è un libro-vocabolario bilingue in maltese e in italiano che insegna il vocabolario maltese in un formato facile da seguire. Mostra un vocabolario basilare per le espressioni più comuni nella vita di ogni giorno. Ogni lezione mostra la pronuncia e l’equivalente italiano di ogni parola. Gli esercizi e le attività insegnano il lessico in maniera ciclica perfezionando la produzione orale, la lettura, la scrittura e le competenze di ascolto. Esplorare la cultura e la geografia maltese. Maltese Grammar Essentials in Context is a bilingual grammar book in Maltese and English. 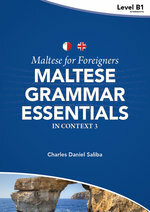 It teaches Maltese grammar in an easy-to-follow format using various readings and situations commonly encountered in daily life. The exercises and activities are designed to teach language in a real-life context in a cyclical manner, while helping in vocabulary acquisition and effective comprehension and communications skills. Grammatica maltese essenziale e contestuale 1 è un libro bilingue (maltese e italiano) di grammatica che ti insegna la grammatica maltese in una forma facile da seguire, usando diverse letture e situazioni comuni nella vita quotidiana. Gli esercizi e le attività sono concepite per insegnare la lingua contestualmente in un modo ciclico che rende possibili l’acquisizione del vocabolario, l’effettiva comprensione e le competenze comunicative. esplorare la cultura e la geografia maltesi. 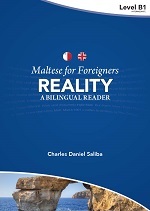 This book contains 22 realistic dialogues, with parallel translations, to help you learn Maltese, improve your reading and listening skills and at the same time work on your speaking skills without having constantly to look in a dictionary. 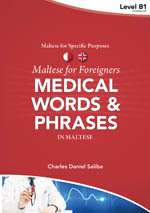 After each dialogue is a detailed table containing new verbs so you can familiarize yourself with how Maltese grammar works. You will also find a box with important expressions and their translations. Make sure that you learn these expressions because they are frequently used in day-to-day conversations. 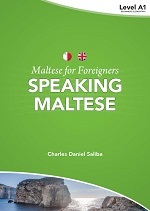 Explore the Maltese culture, place names and people’s names. 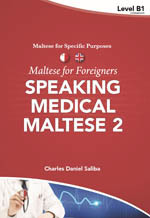 Il libro contiene 22 dialoghi realistici, con le traduzioni, per aiutarti a parlare Maltese, a migliorare le tue competenze di lettura e di ascolto e, allo stesso tempo, quelle comunicative senza aver bisogno di consultare il dizionario. 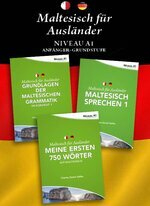 Ogni dialogo è accompagnato da una tabella dettagliata con i nuovi verbi, in maniera tale da renderti chiaro il funzionamento della grammatica maltese. Troverai anche una sezione con importanti espressioni d’uso e le loro traduzioni. Assicurati di imparare queste espressioni perché sono usate frequentemente nelle conversazioni giornaliere. 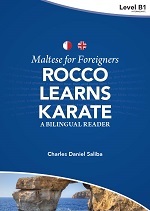 esplorare la cultura maltese, i nomi dei luoghi e delle persone. 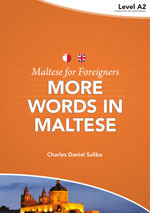 More Words in Maltese is a bilingual vocabulary book in Maltese and English that teaches Maltese vocabulary in an easy-to-follow format. It covers basic vocabulary, intermediate vocabulary and phrases encountered in daily life. Each lesson contains visual and pronunciation aids as well as the English equivalent for each word. The exercises and activities teach vocabulary and phrases in a cyclical manner while sharpening your speaking, reading, writing and listening skills. 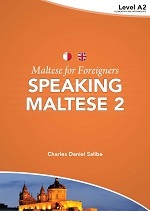 Explore Maltese culture and geography. 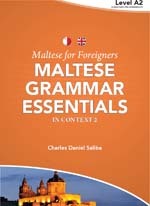 Maltese Grammar Essentials in Context 2 is a bilingual grammar book in Maltese and English. 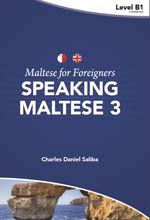 It teaches Maltese grammar in an easy-to-follow format using various readings and situations commonly encountered in daily life. The exercises and activities are designed to teach language in a real-life context in a cyclical manner, while helping in vocabulary acquisition and effective comprehension and communications skills. 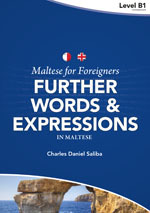 Further Words & Expressions in Maltese is a bilingual vocabulary and expression book in Maltese and English that teaches Maltese vocabulary and phrases in an easy-to-follow format. It covers practical intermediate and specialised vocabulary together with idioms and proverbs. Each lesson contains visual and pronunciation aids as well as the English equivalent for each word, phrase, idiom or proverb. The exercises and activities teach vocabulary and expressions in a cyclical manner while sharpening your speaking, reading, writing and listening skills. Explore the Maltese culture and place names. You can purchase a CD or dual USB for an additional cost and listen to each numbered section being read by a native speaker. The CD is saved in an MP3 format so it can be played on a computer. View CD Cover Leaflet.